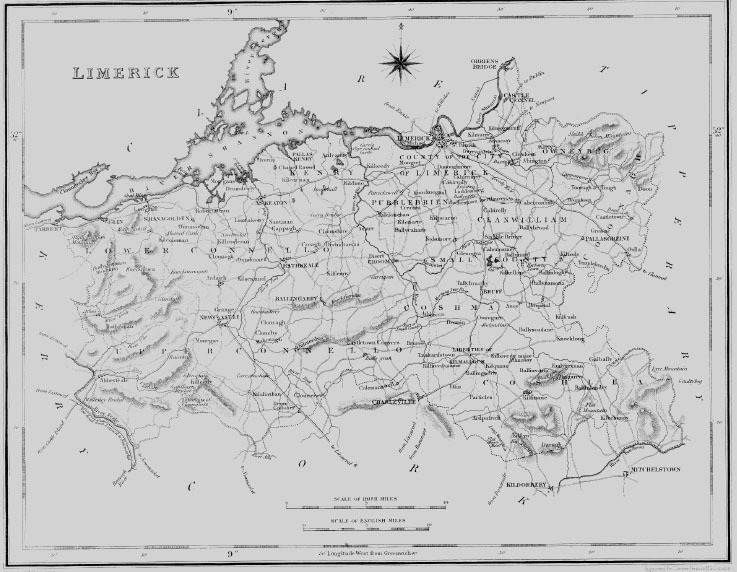 DROMKEEN, a parish, in the barony of CLANWILLIAM, county of LIMERICK, and province of MUNSTER, 3 miles (N.) from Pallas-Greine, on the road from Limerick to Tipperary ; containing 528 inhabitants. It comprises 831 statute acres ; the land is in general of good quality ; about one-half is under tillage, and the remainder is meadow and pasture. There are some quarries of limestone worked for building, and for agricultural purposes. The principal seats are Williamsfort, the residence of H. Croker, Esq. ; and Dromkeen, formerly the residence of the Burgh family, now occupied by the Rev. M. Lloyd. The remains of the ancient mansion show it to have been an extensive and important establishment ; and not far distant are the walls of an old church, in which is inserted a tablet recording its repair, in 1717, by the Rev. Richard Burgh, Lord Bishop of Ardagh, of which family it had been the burial-place from time immemorial. The living is a rectory and perpetual curacy, in the diocese of Emly, united at a period prior to any known record to the rectory of Kilcornan, and the rectory and prebend of Ballynaclough in the cathedral church of St. Ailbe, together constituting the archdeaconry of Emly, in the patronage of the Archbishop of Cashel ; the perpetual curacy is in the patronage of the Archdeacon. The tithes amount to #36. The lands belonging to the archdeaconry consist of the townlands of Kilcornan and Garry-Phebole, in the parish of Kilcornan, and comprise 323a. 3r. 24p., let on lease at an annual rent of #355. 19. 1. ; and the entire revenue is returned by the Ecclesiastical Commissioners at #547. 19. 1. There is no glebe-house. The church is a neat cruciform structure, with an octagonal tower embattled and crowned with pinnacles, erected by a gift of #900 from the hate Board of First Fruits, in 1831, In the R. C. divisions the parish is partly in the union of Greine, or Pallas-Greine, but chiefly in that of Kilteely ; in the latter portion is the chapel, a modern edifice near the parish church.